This article explains the , developed by Francis J. Gouillart, in a practical way. After reading it, you will understand the basics of this powerful quality management tool. What is Day In the Life Of (DILO)? A Day In the Life Of (DILO) study provides insight into tasks that add value in daily work and highlights tasks that do not add value. Identifying these and then eliminating them will improve their work effectively. The Day In the Life Of (DILO) approach is a time management tool and a LEAN Manufacturing, developed in 1994 by the American-French organisational expert Francis J. Gouillart. Lean, too, focusses on preventing inefficiency due to pointless tasks for instance. With the DILO method, employees and teams gain insight into their own working method and the tasks that take up too much time for too little productivity. Day In the Life Of (DILO) is a technique that helps to recognise and detect the effectiveness of the work being done within an organisation. Simply put, it offers insight into a standard working day. The method can be used for individual employees as well as for a group of people or a team which execute roughly the same work. It’s also not always easy to say in advance how much time a manager spends on their team. 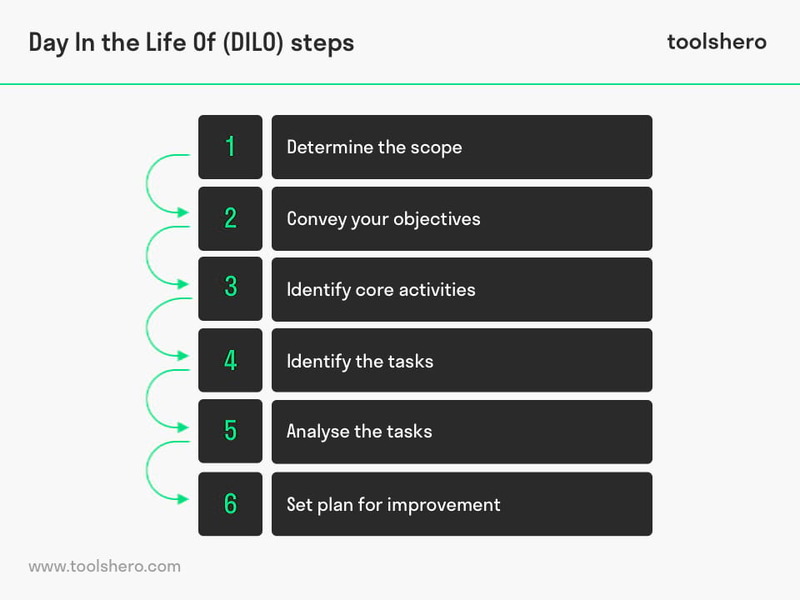 The DILO method allows the entire work process to be followed closely, after which everyone within the team gains insight into their own productivity in the workplace. This can then increase and improve the effectiveness of the team. As a detection method, Day In the Life Of (DILO) can help an organisation gain insight into its own proposition, allowing them to improve from within. When teams work more effectively, this also has a positive effect on the environment and their clients. An outside eye during a working day provides different insights. The other person looks at the work objectively, will ask questions as to why certain actions are taken, is critical and may find that some tasks take up too much time or are unnecessary. They may offer suggestions for an alternative approach. Bottlenecks come to light and ultimately smarter working methods can be worked towards. This is the underlying idea of the DILO method. In his groundbreaking 1994 article, Gouillart indicated that there is a huge gap between the leadership of organisations and its end-users. Although the highest management aims to continuously increase turnover, there’s a lack of insight into the needs of their clients. This insight can be gathered by different layers within the organisation, but if they’re working on other things, there will be too little time to engage with the customers. Today, the Day In the Life Of (DILO) method is mainly used to provide insight into activities and to distinguish which ones do and which don’t add value to the organisation. VA tasks stand for ‘value added’; tasks that add value to the end product and are therefore of value to the client. NVA tasks stand for ‘no value added’; tasks that don’t contribute to the end product. NVA tasks can be split up into NVAU and NVAA tasks; ‘unavoidable’ and ‘avoidable’. Unavoidable tasks might not contribute, but are necessary to carry out within the working process. The avoidable tasks don’t contribute, nor do they add value to the working process itself. The only option is to eliminate these tasks from the process. The Day In the Life Of (DILO) method is time consuming, but worth the investment. Tasks that don’t contribute to the end product and should therefore be omitted are clearly identified. Day In the Life Of (DILO) offers an organisation proper insight into daily activities. Many working days are filled with routine tasks, of which no one remembers why they are done in the first place. The Day In the Life Of (DILO) method adds focus to the organisation and will result in a structural increase of time spent on VA tasks. Firstly, it’s important to decide who or which department would most benefit from a DILO Analysis. Which processes, activities, objectives and other functions take place in the department in question? During this phase, we determine which employees will participate in the analysis. It’s also important to consider the time frame of DILO. This could be a working day or a week for instance. The longer the time frame of a Day In the Life Of (DILO) Analysis, the more accurate picture you will get. Before you start with a Day In the Life Of (DILO) Analysis, you should explain to the team members what the goal is and how you’re planning to use the information or data. This will avoid ignorance, suspicion and possible anxiety amongst employees, and allow them to cooperate as transparently as possible. Beforehand, you must identify a set of core activities that the employees execute. This is the basis from which the DILO analysis can draw its conclusions. By categorising core activities in advance, you can clarify priorities. These tasks may be categorised into routine job tasks, meetings, paperwork, travelling and waiting times and so on. Participants will fill in a Day In the Life Of (DILO) worksheet for the agreed day or week. They then add a category (as determined in Step 3) to each task. They must be very observant during the analysis, labelling each activity VA or NVA. It works best to also include the time spent on each activity. Subsequently, the Day In the Life Of (DILO) Analyses of all employees are collected and scrutinised. The NVA activities are then divided into NVAU or NVAA. This already allows for a list of improvements to be made. Especially NVAA tasks don’t add value, so they should eventually be ceased. The main purpose of Day In the Life Of (DILO) Analysis is to enhance the effectiveness of work environment. It’s advised to share the information with the team members, when the analysis is completed. Especially the employees often offer good solutions, new ways of working and increasing productivity. Setting a plan for improvement together is both motivating and stimulating. Awareness of ingrained work habits will increase and new insights will be more widely supported. What do you think? Is the Day In the Life Of (DILO) method applicable in your personal or professional environment? Do you recognize the practical explanation or do you have more suggestions? What are your success factors for good and lean process management?